Shilajit is a powerful natural adaptogen which is formed from compressed organic vegetable matter that grows on high altitude mountains, cliffs, and rocks. When it’s ready, it seeps from the rock crevices as a dark gummy resin. We sustainably source our shilajit directly from the mountains of Siberia, purify it, and pack it into Miron violet glass containers to preserve the quality of the nutrient-rich superfood. Shilajit is believed to be one of the richest sources of minerals found in nature, containing over 85 of them in ionic form including iron, calcium, and zinc. What is Organic Miron Glass? The Ancient Egyptians first discovered the powerful properties of violet glass when they used it to store precious essential oils and tonics. Our shilajit is packaged in high-quality Miron violet glass, which has been proven to protect the contents from UV light and in turn effectively maintain the nutritional freshness and potency of the resin. The Miron glass jar will beautify your pantry, and it can be recycled when empty making it eco-friendly. You can also reuse the jar after you have finished the shilajit, and use it to store oils, creams or snacks. The Miron glass jar will extend the shelf-life of the shilajit, but we still recommend storing it in a cool, dry place. How Do I Use Shilajit? Our shilajit is extremely potent, so you’ll only need to add a pea-sized amount (300-500mg) of the resin to a glass of warm water and then stir until it is fully dissolved. You can pinch of a small amount of the resin, and then pop it into warm water, stir and drink straight away. Some people like to take their shilajit as a 'shooter' for a quick morning pick-me up (see below for the recipe). It does have a distinct smoky flavour, which many people grow to love (and crave), so you can also dilute it a little by using it in tonic teas, smoothies and juices. If it's your first time using shilajit, always start with a smaller dose and see how you feel and then you can then work your way up to a larger dose. You can take your dose of shilajit up to three times per day. 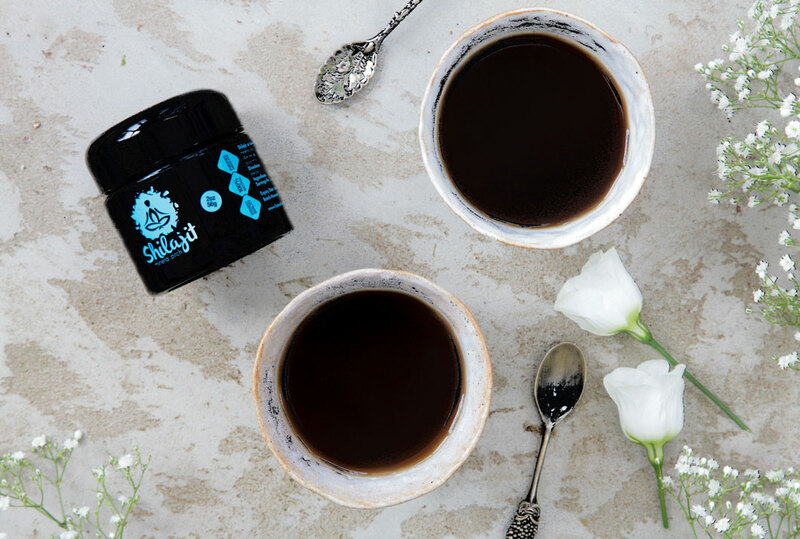 Because of it's pick-me-up qualities, shilajit is best enjoyed first thing in the morning on an empty stomach, and many people choose to use it much like a coffee alternative. Although it can be enjoyed throughout the day, we recommend not taking it just before bed. For a creamy and satisfying elixir, the smoky flavor of shilajit works well when dissolved in warm water and blended with nut milk, ground vanilla beans, a pinch of cinnamon, and a teaspoon of coconut oil. 'Not your average shot', this is an excellent way to take your shilajit. Simply create shooter, and then down it in one first thing in the morning. In order to absorb the many nutrients in your shilajit shot, it's best to take it on an empty stomach. Pour around 50ml of boiling water into a mug. Pinch off your chosen amount of shilajit, drop it into the water, and then stir until it is fully dissolved. Add a dash of cold water to make the shooter the right temperature to drink. Pour into your shot glass, and down it in one! You can also add in plant milks, date syrup, vanilla, and coconut sugar to adjust the flavour and create your own shilajit morning shot. If you want something to sip on, this delicious shilajit tonic is the way to go. The cayenne and cinnamon help to add a little spice to the mix, and they blend well with the smoky flavour profile of the shilajit. You can enjoy your spiced shilajit tonic warm, or pop it in the fridge or add some ice cubes to make a tasty iced drink to cool you down (and pick you up) on a warm summers day. Pour a 1/2 a cup of boiling water into a mug. Drop in your chosen amount of shliajit and stir until it is fully dissolved. Add in the plant milk, a dash of cinnamon and a dash of cayenne pepper, and the two dates. Transfer to the blender and then whizz it up on a high speed until you have a smooth, creamy, and frothy mixture. Pour into a mug and enjoy instantly. This is a particularly lovely drink to take on hikes or camping, so you can pour straight into a Thermos flask, and then enjoy it on your trip. I love this shilajit, it feels deeply nourishing. I put a dab in my coffee every morning, in hopes of invoking the strength of the Himalayas. I had never used shilajit and now it's an every day staple. I dissolve a pea-sized amount in water and drink it all morning, every morning. Most minerals make me queasy, but these don't, which is great because I practice a lot of intermittent fasting. Not sure if it's the shilajit but I've heard it benefits weight loss and since using, I lost 10 pounds quite quickly while feeling a consistent calm energy, well-nourished, and undisturbed sleep. Wonderful company, and great customer service too. I am a fan and so glad to have been introduced to this gorgeous product. I take about .7 grams in the morning on an empty stomach. It gives me a lot of energy throughout the day and into the night. Before taking this, I had a lot of fatigue and no motivation to do anything. This changes everything. I highly recommend. I have only used the shilajit for 3 days, so too early to list benefits. I was using shilajit from another company, but kept running out too soon, as I and my parents are taking it. I was getting 15 grams for the same price that I'm now getting 56 grams for, thanks to hybrid herbs. No difference in quality either, both are the same consistency and taste the same. I do believe this shilajit from hybrid herbs to be of the best quality and such a better deal.